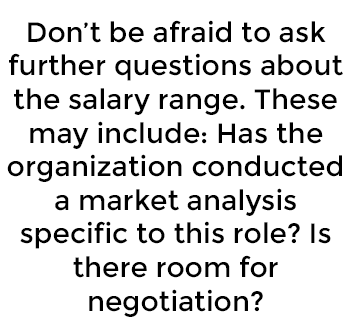 Research the market salary range for the position before speaking with the hiring manager or search firm. It’s critical to have this information ahead of your first call. Use resources such as Guidestar and, more cautiously, Glassdoor and check with national societies and associations in your field, which often conduct annual compensation surveys. Examples for fundraisers are AFP, AHP, and CASE. Ask for the salary range during your first conversation with the hiring manager. If they request your salary expectations, counter with a question about how the salary range was set. Before sharing your expectations, you want to understand what the organization expects to pay and how they arrived at that number. Don’t be afraid to ask further questions about the salary range. These may include: Has the organization conducted a market analysis specific to this role? Is there room for negotiation? Candidates often feel uncomfortable or apprehensive broaching the subject of salary early on in the hiring process. However, posing direct questions will ensure that you and the hiring manager stay in sync throughout the process. Understand that organizations need to start at the low to midlevel of the salary range. When a hiring manager shares a $125,000-$150,000 range, many jobseekers picture themselves at the $150K end. In reality, the upper level may indicate room for the position's pay raises over the next few years. The high end is generally reserved for the most exceptional and experienced candidates. If you have an initial offer, be proactive to ensure that the salary meets the current market range and counteroffer if necessary—with data to support your request. Using the research you did at the outset, you should be well-positioned to make a counteroffer should the need arise. Some organizations will offer a lower salary expecting a counter, so remember that you have the ability to negotiate during an offer. If you counter the initial offer, ensure you're making an equitable counter both for your needs and the organization. Discussing salary has always been tricky, but California’s recent salary history ban and other pay equity laws are seeking to create a fairer and more transparent job search process for everyone. My colleagues and I strive to be a resource to nonprofit jobseekers, so please don’t hesitate to leave a comment or contact me directly with questions. Dan Nevez is a Senior Consultant, Executive Search at Campbell & Company, with a primary focus in senior and C-suite level search for mission-oriented organizations. 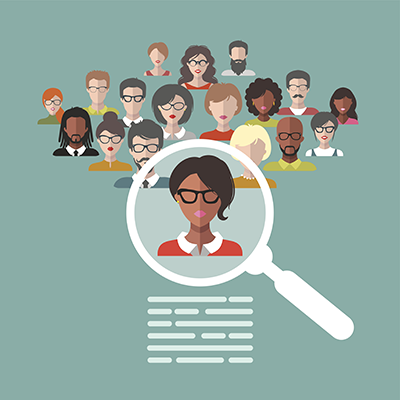 He works to identify high-performing candidates from diverse communities and sectors in order to place the right leader.